So what REALLY happened on October 17 1814? I can stake a tenuous family link to the Great London Beer Flood disaster of 1814, which took place exactly 196 years ago today. My great-great-great-great grandfather on my mother’s side, Maurice Donno, was living in Soho, a minute or three’s walk from the Horse Shoe Brewery off Tottenham Court Road, when a huge vat of maturing porter at the brewery collapsed violently and flooded the surrounding tenements, killing eight people. Most, if not all, of those who died were poor Irish immigrants to London, part of a mass of people living in the slums around St Giles’s Church, the infamous St Giles “rookeries” (later to be cleaned away by the building of New Oxford Street in 1847). Maurice Donno was very probably Irish, his surname most likely a variation of Donough or something similar (which would make his first name a common Anglicisation of the Irish Muirgheas). Perhaps he knew some of those who died, or were injured, in the Great Beer Flood, or knew people who knew them. It seems very likely he would have gone across the road at some point after the tragedy, to join the hundreds who came to see the destruction wreaked by that dreadful black tsunami of beer. What has prompted me to write about the Great Meux Brewery Beer Flood, is not the anniversary, however, It’s because I have finally been called out over some dodgy maths in the book Beer: The Story of the Pint, which I wrote in 2003. 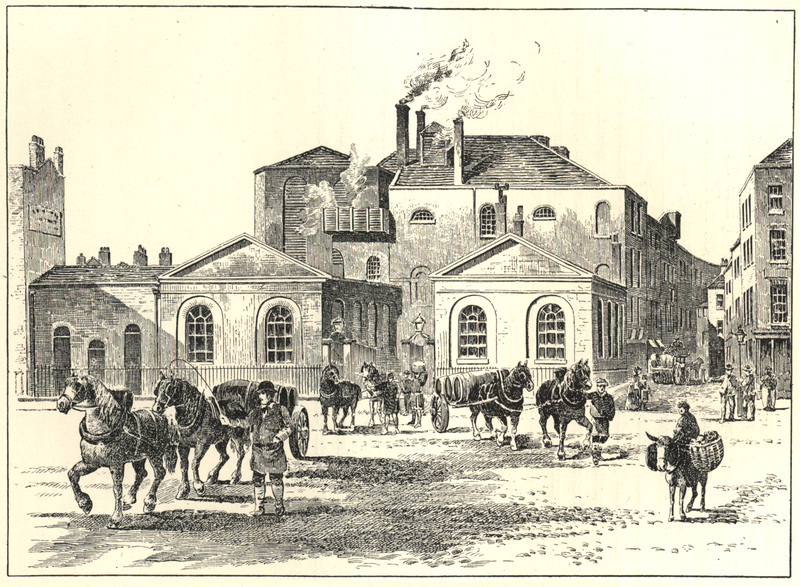 I said in BTSOTP, correctly, that the vat of porter which burst suddenly on Monday October 17, 1814 at Henry Meux’s Horse Shoe Brewery contained 3,550 barrels of beer. I said, correctly, that this amounted to more than a million pints. Then for some mad brain-burp reason I said the beer in the vat weighed “around 38 tons” – almost precisely 15 times less than the correct answer, which was actually more than 571 tons.